The Points Doctor: Why You Should Put Your Airline Credit Card in a Drawer. Why You Should Put Your Airline Credit Card in a Drawer. If you’ve been following me at all, you know how much I love flexible points like Chase Bank’s Ultimate Rewards (UR). Chase has most of the great point earning bonus cards out there, so once in a while it’s nice to see a great card product that isn’t Chase. You can’t have all the cards in your arsenal from one bank. At some point Chase will not extend you any more credit. However, Chase is pretty generous about moving around lines of credit from one card to another. They may even allow you to mix business lines and personal lines. Since I’ve already discussed UR points in a previous post, today let’s talk about another two of my other favorite cards; the Amex Starwood Preferred Personal and Business Cards. Starwood Hotels are among some of the nicest hotels in the World. If you aren’t familiar with the Starwood chain, they have the Sheraton brand, as well as the Westin, W, St. Regis, The Luxury Collection and several other brands. Their award chart is very reasonable with redemptions starting at 2000 points per night. Starwood has a 5th night free option as well. In other words, for each 4 night stay you book whether you pay cash, or redeem points, you get a 5th night free! My wife and I are taking advantage of that early next year with a 6 night stay at the St. Regis Punta Mita. Another great benefit of Starwood is their Cash and Points option. Simply put, for a small amount of cash you can use fewer points to book than the typical award stay. This is a great way to stretch your Starpoints. You just need to make sure the math works for you. I will discuss the Cash and Points Option in more detail in another post. Starpoints like UR points are also tremendously flexible They have the most transfer partners of any card. For example, there are 31 different airline transfer partners! Why is this important? You never know which airline is going to have the best deal at the time you are booking. Having flexibility allows you the freedom you don’t get with a specific airline card. With your specific airline miles earning card, you earn miles at a 1:1 ratio of dollars spent to miles earned for everyday purchases. With the Starwood card you will also earn points at a 1:1 ratio. But, when you transfer Starpoints to almost any one of it’s 31 transfer partners, you get a 25% bonus when you transfer in increments of 20,000 points. For each 20,000 points transferred, you get 25,000 miles. Not only are you beating the earning rate of your airline specific card on everyday spending, but you can use the miles on any of the 31 partner airlines! How’s that for flexibility? I’m not saying that you shouldn’t hold an airline specific card, but put it in the drawer for everyday spending. Get yourself a Starwood personal and business card today! The sign up bonus is currently 25,000 Starpoints. Disclaimer: I do receive a small compensation from American Express if you allow me to send you a link to sign up for the Starwood cards. If you liked what you’ve learned here on my blog, I would appreciate the use of one of my links. You can email me @ ThePointsDoctor@comcast.net. to receive links for both cards. Thank you. The Points Doctor is Bruce J. Wilderman DDS of Artistic Expressions Dentistry.Dr. Wilderman has a practice limited to Cosmetic Dentistry, serving patients of the Philadelphia Area since 1986.He and wife of 30 years enjoy traveling the world for little or no money with the points and miles they have earned from the credit card companies. Dr. Wilderman would love to teach you how to do the same. 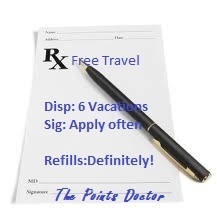 You may reach him at ThePointsDoctor@comcast.net or visit his blog @ ThePointsDoctor.blogspot.com.